Last week we checked out Solomon’s words regarding wisdom and learned that no matter the path you’re on, there’s always opportunity to get back on the right path. Maybe you’re here and you’re thinking, I don’t know the right path to take. I didn’t even know there was a path. Today is your lucky day! Today, Easter is celebrated all over the world, but do we really understand this day that many people celebrate? Is it just another consumer holiday where we look forward to seeing everyone’s new outfits and enjoy chocolate and jelly beans? Maybe you enjoy Easter because it generally marks the beginning of Spring. I don’t want you to miss the miraculous and eternal significance of Easter. But I’m getting ahead of myself, let’s go back in time from the first Easter to a week or so earlier. Take the time to read our passage for this morning found in Luke 19:28-40. So who is this Jesus? The name Jesus brings many thoughts to people’s minds. Names are like that; they mean a lot. Sometimes nicknames are commonly associated with people and are instantaneously recognized. Old Blue Eyes – Frank Sinatra. The King of Pop – Michael Jackson. The King – Elvis. Michael Jordan is known as Air Jordan. There are the not so great people like Ivan the terrible , Jack the Ripper, Bloody Mary, and Vlad the Impaler. Biblically we have John – the Baptizer. Lydia – the seller of purple. Few people call him just Thomas without preceding it with doubting. These descriptive names are no different for Jesus. In Matt. 1:21 an angel appeared to Joseph and told him, “She will bear a Son; and you shall call His name Jesus, f He will save His people from their sins.” Jesus means Jehovah is salvation. Jesus most often referred to Himself as the Son of Man. He is known as the Messiah. The Light of the world. The Prince of Peace. The bright and morning star. He is the alpha and the omega. He is the redeemer, the advocate, the bread of life. He is the power of God. He is the Lamb of God, the good shepherd, the high priest. He is the King of kings and the Lord of lords. He is the resurrection and the life. That’s who Jesus is. This Jesus was loved by people of all walks of life. This is the Jesus that the prophet Micah said would come to rule Israel, One whose, “Goings forth are from long ago, from the days of eternity.” While loved and adored by the common people, this Jesus was despised by the religious groups of the day – the Pharisees and the Sadducees. Jesus upset the apple cart; He rocked the boat; He went against the flow, He said things that were different than what those religious people had been taught and what they believed. They called Jesus a blasphemer, they judged Jesus because He hung out with the less desirables; the tax collectors and sinners. They accused Him of violating the Sabbath because He encouraged His disciples to pick grain when they were hungry. They didn’t like this, in fact, “The scribes and the Pharisees were watching Him closely to see if He healed on the Sabbath, so that they might find reason to accuse Him.” (Luke 6:7) Jesus taught on the Sabbath, Jesus healed on the Sabbath. What is sin? If we redefine what sin is, it’s easier to deal with. In our culture, we conform to the idea that personal feelings are the barometer of right and wrong, of morality and truth. We seek comfort and the least resistant path. We seek to please ourselves. We listen to so called “Christian teachers” or influential people who make us feel better about following our own path, about living in sin. Instead of calling people to repentance and authentic Christian living, these people refuse to call sin what God calls sin. We have a whole new generation of people that have succumbed to cultural pressure that it’s intolerant, judgmental, and unloving to declare God’s truth as absolute. I love Paul’s description of this found in Gal. 5:19-21 that says, “Now the deeds of the flesh are evident, which are: immorality, impurity, sensuality, idolatry, sorcery, enmities, strife, jealousy, outbursts of anger, disputes, dissensions, factions, envying, drunkenness, carousing, and things like these, of which I forewarn you, just as I have forewarned you, that those who practice such things will not inherit the kingdom of God.” Evident is from the word that mean plainly recognized. These are the things of the flesh – they are incompatible with a life that follows God. Left to our own devices, we cannot enter the Kingdom of Heaven. We know who Jesus is, and we know why we need Jesus, now finally, what should we do with Jesus? In answering this very question to the Jews that gathered in the treasury at the temple in Jo. 8:34-36: “Jesus answered them, ‘Truly, truly, I say to you, everyone who commits sin is the slave of sin. ‘The slave does not remain in the house forever; the son does remain forever. So if the Son makes you free, you will be free indeed.’” There is freedom in Christ. It’s freedom from the penalty of sin, not from the consequences. God will not and cannot allow us to get away with sin, but don’t expect to see someone’s nose grow if they tell a lie. We live in such a hectic, no time for anything world; a world where we seek instant gratification. Our cure then, comes not by redefining sin or by avoiding it. Our cure comes by admitting our sin, turning from it and receiving Jesus Christ as Lord and Savior. Easter is about hope, it’s about life; it’s about fulfilled promises; it’s about Jesus. Maybe you’re thinking, “I want to be free, how do I get this freedom?” To answer that question, we need to go again to the standard of truth. Remember that each of us is a sinner, we have all done wrong. Rom. 6:23 says, “For the wages of sin is death, but the free gift of God is eternal life in Christ Jesus our Lord.” As with any gift, you must accept it; just because it has your name on it does not make it yours until you receive it. Maybe if we just try harder to be good and righteous. No, the answer to sin is not to try harder to avoid it or change who you are. No matter how hard you try, no matter how good you are, it’s not enough. Eph. 2:8-9 says, “For by grace you have been saved through faith; and that not of yourselves, it is the gift of God; not as a result of works, so that no one may boast.” Rom. 10:9 says, “If you confess with your mouth Jesus as Lord, and believe in your heart that God raised Him from the dead, you will be saved.” Confess is a great word. It means the same thing as agree. In other words, when you confess to God your failure to meet His standard or admit your wrongdoings, you are agreeing with Him. Maybe you’re thinking God won’t accept you like you are. Pastor Ian if you only knew about me. Maybe you’re thinking, when I give up ___________, I will be good enough and I’ll trust in Christ. Here’s the good news: “But God demonstrates His own love toward us, in that while we were yet sinners, Christ died for us.” (Rom. 5:8) We don’t have to try harder because God knows that apart from Christ, we can do nothing. (Jo. 15:5) Rom. 10:13 says, “For ‘WHOEVER WILL CALL ON THE NAME OF THE LORD WILL BE SAVED.’” You are that whoever. It is a guarantee. Becoming a Christian is a choice; it is a decision only you can make for yourself. Being a Christian really means being a follower of Christ. God changes your heart, changes your attitude, and you joyfully want to follow Jesus. It’s not something you do begrudgingly. Being a follower of Christ gives you freedom! You are not a Christian because you live in America or because you attend church, or because you pray or read the Bible, or go to a Bible study. You are a Christian because you have made a decision to trust in what Christ did to pay the penalty for sin; you choose to follow Christ. Paul gives us this hope in Rom. 6:10-11, “For the death that He died, He died to sin once for all; but the life that He lives, He lives to God. Even so consider yourselves to be dead to sin, but alive to God in Christ Jesus.” “To all who received him, to those who believed in his name, he gave the right to become children of God.” (Jo. 1:12) So how did we get to the point of death? What began just five or so days earlier as Jesus rode into Jerusalem on a colt with people waving palm branches and expressing their adoration for this man from Galilee, was overwhelmed by the crowds in Jerusalem that demanded His death by crucifixion. They got what they asked for and Jesus was sentenced to die on a cross for being found guilty of nothing. Jesus dies a horrible death on the cross and was buried in a tomb. The rest of the story is found in Luke 24:1-9. 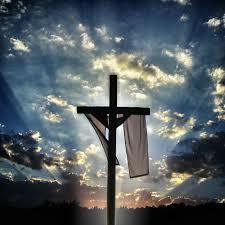 Easter is all about the penalty Jesus Christ paid to cover our sin debt. He shed His blood for you, because of His incredible, unending, unconditional love. He is not here because He is risen. 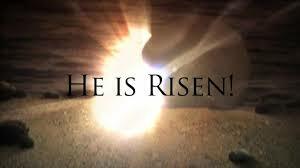 Easter is all about the resurrection of Jesus Christ and the new life that He can give you. You have heard about who Jesus is and why we need Jesus. You have heard about what you should do with Jesus now there remains just one question. What will you do about what you know?